John Wyndham - The Day Of The Triffids | Vault Of Evil: Brit Horror Pulp Plus! Fantastic, frightening, but entirely plausible, John Wyndham's famous story of a world dominated by monstrous, stinging plants catches the imagination like the best of H. G. Wells. 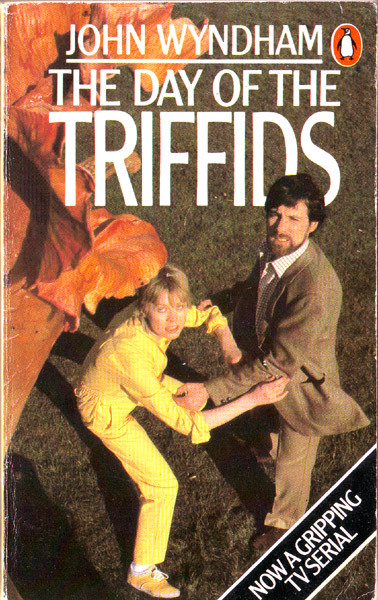 The front cover shows John Duttine and Emma Relph in Douglas Livingstone's adaptation of The Day of the Triffids, directed by Ken Hannam and produced by David Maloney. A BBC TV Production in association with RCTV Inc. and the Australian Broadcasting Commission. Biologist William Masen has just endured a miserable week in St. Merynn's hospital recovering from a vicious triffid sting. His head swathed in bandages following eye surgery, Masen is one of the very few who missed May 7th greatest firework show in history as a trillion shooting stars turned the night sky green. To crown it all, now he's convinced that he's somehow lost four days out of his life. It should be midweek but judging by the eerie silence - give or take the occasional moan or scream from the street outside his window - this has to be bloody boring Sunday. Preparing himself for the worst, Masen carefully unwraps the cloth from his eyes to discover his sight has been restored fully. Now to go find out what the Hell is going on. A trawl of the wards confirms that something very dreadful has happened. The entire hospital seems to be deserted, save for Dr. Soames groping along a wall in the corridor like a blind man. Soames demands the patient help him find his office on the fifth floor and, once there, hurls himself through the window before the horrified Masen can lift a finger to stop him. Further exploration of the wing reveals a basement full of groaning blind men and bloodied corpses littered about the stairwells. Masen does what, i'm sure, many members of this board would do in the circumstances. He heads for the nearest pub. Inside The Alamein Arms, the public bar is empty though somebody is getting mightily pissed and pissed off in the Saloon, throwing full bottles of gin at the walls and generally carrying on. He is the landlord, blind as a bat and suicidal drunk on whiskey. Yesterday his wife gassed herself and the kids, and he's bent on joining them after his endparty. As yet no sign of Triffid activity on the streets, but Masen is an expert on the subject and perhaps, secretly, something of a fan. After all, he owes his career - and now, bizarrely his sight - to them. Originally cultivated in a dish in the hope their juice, rich in minerals, would solve the planet's nutritional needs, the triffids sprung up at all points of the globe during Masen's childhood (he's now pushing thirty). His family were the first in their neighbourhood to have one pop out from their rockery. At first nobody worried too much about them, even if their growth rate was phenomenal (up to ten feet tall in the Tropics). Then the Chinese reported that one of theirs had got up and 'walked' - a phenomenon soon repeated across the world. Not only are the triffids carnivorous, their tendrils possess a sting that can prove lethal, and they can communicate secret messages to one another. They might be clumsy and amusing to a person possessed of all their faculties, but the last thing you want to be with a mob of these things abroad is blind! "Take away our sight and our superiority to them is gone." As far as current reading goes, London is on the wrong end of a twin-pronged attack from evil spiders (Spiders) and oversized animated carnivorous plants. Masen is wandering 'the groping city' now. Scores of the newly blind have converged on Piccadilly Circus, desperately seeking the assistance that has been in zero supply up until now. A group have formed around an amiable drunk who, having fortuitously missed out on the cosmic light-show, can at least lead them on a decent pub crawl. They make for the Cafe Royale where the staff are no longer in any position to enforce a dress/ wallet code. An Evangelical preacher, for whom the catastrophe is truly all his Christmas's come at once, bellows out sermons of the "Repent! Repent!" variety. A young mother clings on to her infant daughter, visually unimpaired, but how long can they survive? Masen slips away into a graveyard where he shares a sandwich with a sparrow to the accompaniment of a mournful voice sobbing out a overwhelmingly sad and lonely song until .... eerie silence. Masen, thinking beyond his next drink, jumps to the rescue of a young woman, bound at the wrists, reeling under the blows of a vicious drunk. Josella Patton inadvertently slept through the night of the seventh after some rotter spiked her drink at a party. She's anxious to check on her elderly father. Masen overcomes his now redundant principles, steals them a car and drives over to St. John's Wood. On the way, they spot a number of triffids lumbering in the direction of Oxford Street. Josella's concern for her father's welfare proves justified. A triffid has broken in and killed the old boy while its mates creak about outside doing unpleasant things to a corpse. For the sightless majority, things can hardly get worse with the coming of night. You can't leave it there, Mr Dem! Curiously enough, where you left off is exactly where I am at the mo'- Josella's pop having been obliterated by those diabolical plants, but going out in style in a silk dressing gown. The amount of booze being put away is incredible, those blinded having to risk gin in their search for scotch. Part of a (possibly forthcoming) Triffidfest - John W's book to be followed by the hilarious '62 film, the well-respected Beeb 1981 TV series (which I've never seen), the much less well respected 2010 Beeb bash with a shotgun toting Eddie Izzard, and, if Brian Pern's musical fails to materialise, I'll have to settle for Simon 'Pink Fairies' Clark's Night Of The Triffids as a finale. Send for Monty Don! Was there ever a tie-in paperback for the 1963 movie version? Yes; there was a hardcover edition published in the UK. The U.S. had "sort of" a tie-in, meaning no actual photos or film credits on the paperback cover, but the film is mentioned. I don’t think this is quite correct. I’m sure that in Wyndham's novel the triffids were kept captive on farms to be 'milked’ for the oil they secreted. It's been a long time since I read Day of the Triffids, but I thought that the most effective scenes were towards the beginning of the book where the widespread blindness is just beginning to become apparent. There's a passage where the protagonist hears someone playing a piano in a flat and suddenly the music stops and is replaced by desperate sobs. Also, the bit where blind adults are trying to get their unaffected toddlers to lead them to food, but the children are far too young to comply. For me, the story did drag a bit towards the middle then picked up at the end. I liked how Bill sabotaged the vehicle, leaving those who wanted to take away the girl stranded and surrounded by triffids. I have a copy of Night of the Triffids but have yet to read it, so no idea what it is like.